In today’s buildings, the role of structured cabling is growing. Lights, cameras, access control readers, and wireless access points are among the devices that are connecting to the network, making buildings smarter, more efficient, and easier to manage. Thanks to updated standards, new connectivity methods have been defined, that make it easier than ever to connect those devices to the network. 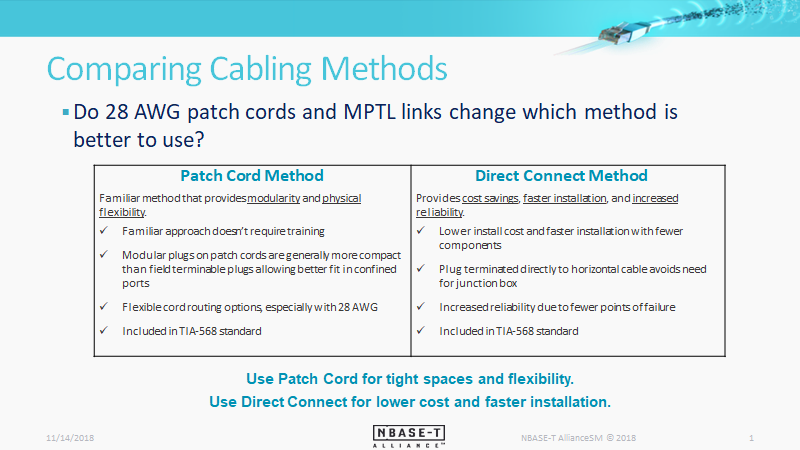 In August, the latest revision of the Balanced Twisted-Pair Telecommunications Cabling and Components Standard (ANSI/TIA-568.2-D) was issued, with two key changes for network devices: the adoption of Modular Plug Terminated Links (MPTL) and 28 AWG patch cords as solutions that now fall within the scope of the standard. The impact of these updates in the standard is most evident when connecting NBASE-T devices. Now there is the option of direct connecting those cameras, access points, lights, and other devices using a field terminable plug. Or, when needed, use the traditional method of terminating the horizontal cable into a jack that is mounted in an outlet of some sort, and then connected via a patch cord. In a recent webinar, New Standardized Cabling Options for NBASE-T Devices, I spoke with Peter Jones about the benefits of each of these connection types and the scenarios where each is best used. There isn’t one method that is right for every application in every building all the time. I offer guidance during the webinar on how to decide which solution is best, depending upon the location, device, and other factors. Also, you’ll hear throughout the webinar about the importance of having a high-quality structured cabling infrastructure from a reputable vendor. As more and more building systems are becoming dependent upon the network, the need for an infrastructure that performs as expected – or better! – is increasingly important. We’ve found that our Panduit customers are embracing these new technologies when connecting devices. With standards bodies now recognizing the new connectivity options, and a growing number of manufacturers offering the components, the use will only continue to grow.